We’d love your help. 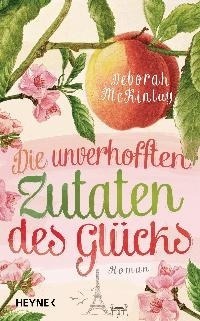 Let us know what’s wrong with this preview of Die unverhofften Zutaten des Glücks by Deborah McKinlay. Aus einer Laune heraus schreibt die Britin Eve dem amerikanischen Bestsellerautor Jack Cooper einen Leserbrief. Und er antwortet! So beginnt eine wunderbare Freundschaft. Beide teilen die große Leidenschaft für das Kochen und gutes Essen – und beide stecken mitten in einer existenziellen Lebenskrise. Sie spenden sich gegenseitig vorsichtig Trost und Rat, wodurch ihre Beziehung immer inniger wird. Schließlich schlägt Jack ein Treffen in Paris vor. Doch das, fürchtet Eve, kann niemals stattfinden . . .
To ask other readers questions about Die unverhofften Zutaten des Glücks, please sign up. Was it a a really interesting and good read? Karen Ribler Yes! It was a fun read, especially if you enjoy cooking. This was a perfectly pleasant story about a man and a woman and their correspondence about life and food and how it gives both of them the strength to make the changes they need to make in their lives. I saw a lot of comparisons to The Guernsey Literary & Potato Peel Pie Society, but there was nowhere near that same depth. It was cute but forgettable. Recommended for: people who like books with pretty covers. Light, quick read that made me want to cook - until I remembered I don't like to cook. I enjoyed reading this, I felt a great empathy for Eve, she's a lot like me character, lives in anxiety, love to cook and read, I think it describes me perfectly. I don't think it's a book very pretentious, it is a simple, very real history, problems and common stories in many families. The typical conflict of a mother who always had a distance with her daughter and did not relate to the same and that when she decides to get married, the mother begins a reflection on these issues. And the age crises, where we wonder often what we are doing in life and what is the best way to go on. British Eve Petworth writes a fan letter to Jackson Cooper, a popular American detective fiction author. In this part-epistolary novel they find a shared love of gourmet cooking. Jack and Eve both are also facing midlife challenges. As the novel progresses and they get to know each other, their letters get more personal. Jack is dealing with writer's block, his second divorce, and meeting women. There are many humorous moments in Jack's life especially when he plans elaborate dinners, but his new British Eve Petworth writes a fan letter to Jackson Cooper, a popular American detective fiction author. In this part-epistolary novel they find a shared love of gourmet cooking. Jack and Eve both are also facing midlife challenges. As the novel progresses and they get to know each other, their letters get more personal. Jack is dealing with writer's block, his second divorce, and meeting women. There are many humorous moments in Jack's life especially when he plans elaborate dinners, but his new vegetarian girlfriend will eat nothing but a salad and bread. Eve's daughter is getting married and having to cope with blended families during the wedding planning. Shy Eve is prone to anxiety attacks, and the wedding is bringing back painful memories of her difficult mother and her hurtful former husband. As Eve and Jack confide in each other through written letters and e-mails, they form a strong friendship and wonder if they should meet in person for a foodie holiday. Lovers of good food will especially enjoy this book. The story was light and relaxing without being fluff--perfect for a vacation read. While we follow Jack and Eve's stories separately the unifying dialogue for either, both and their letters is food. While some stories will write about food, or tell you it is there but then neglect to tell you about it, this story makes feel real and friendly. The foods and recipes from either side of the Atlantic keep the narrative focused and make it feel very real and very homely. I received a copy of this book for free through Goodreads First Reads. How do you take a simple, ordinary, every day storyline and turn it into something spectacular? Ask Deborah McKinlay. She knows. "That Part Was True" is an amazing journey of "normal", told in such a real way that you can't help but feel every ounce of emotion. The happiness, the sadness... it's all there. I wasn't sure I was going to enjoy this book. 10 pages in, and my thoughts were "At least it's easy to read" (the writing is I received a copy of this book for free through Goodreads First Reads. I wasn't sure I was going to enjoy this book. 10 pages in, and my thoughts were "At least it's easy to read" (the writing is superbly fluid and comfortable). After that, the book grew on me - I loved it - and as with all great books, I was disappointed to reach the last page. "That Part Was True" should be a modern classic. Letters, food and England - 3 of my favorite elements of a good story. When Eve Petworth writes a fan letter to an Jackson Cooper about a scene in one of his books, it begins a back and forth correspondence between them. Their letters mainly focus on food and cooking but gradually personal bits start to be included and they share the things going on in their lives with each other. Plans to meet in person keep being offered but they never work out. Right up to the last page, it's unclear whether these two will ever meet, even as they become more and more important t When Eve Petworth writes a fan letter to an Jackson Cooper about a scene in one of his books, it begins a back and forth correspondence between them. Their letters mainly focus on food and cooking but gradually personal bits start to be included and they share the things going on in their lives with each other. Plans to meet in person keep being offered but they never work out. Right up to the last page, it's unclear whether these two will ever meet, even as they become more and more important to each other. I loved the concept of this book, with letters to each other interspersed with vignettes about their lives. Both Eve and Jack have difficult issues in their lives and cooking is an outlet for the stress and fear that they have. Eve has a poor relationship with her headstrong daughter and sees herself as a passive doormat. Jack is struggling with his vision as a writer and with the wreck of his second marriage. In the letters, Eve and Jack reveal things they have been afraid to let anyone else know and find solace in each other. Light and fun and life-affirming. This novel shows that middle-aged people can reinvent themselves. A gorgeous little novel that leaves you feeling all warm and fuzzy. It's a sweet exploration of love and identity. This is one of those books where what as much understanding comes from the unsaid parts as the bits the reader is privy to. Eve Petworth, a wealthy privileged middle-aged English woman writes a letter to American author, Jackson Cooper, after reading one of his novels. They have a meeting of minds over food in their short missives across the Atlantic. Both have reached a stage in their lives where they realise things have to change but neither seem to be able to work out what they need to do to a This is one of those books where what as much understanding comes from the unsaid parts as the bits the reader is privy to. Eve Petworth, a wealthy privileged middle-aged English woman writes a letter to American author, Jackson Cooper, after reading one of his novels. They have a meeting of minds over food in their short missives across the Atlantic. Both have reached a stage in their lives where they realise things have to change but neither seem to be able to work out what they need to do to achieve a more fulfilling life. This is a short but deceptively meaningful book which covers a number of issues. Eve needs to understand her relationships with both her daughter Izzy and her recently deceased mother Virginia. Jackson needs to work out what he really wants from life; recently divorced he is struggling to write his latest novel. This is a gently moving story that illustrates that it is never too late to make changes to life. I was drawn to read this book because it was written by letters but the truth is these are much shorter and say far less than I expected. The bulk of the story is made up of Jackson and Eve’s struggles to come to terms with the changes in their separate lives. I received a copy of this book from Amazon Vine in return for my honest review. Ora cá está um livro em que a capa nada remete para o conteúdo. Olhando para a mesma fica-se com a sensação que vamos ler um romance histórico. Foi a ideia que tive quando vi o livro pela primeira vez. E foi a leitura da sinopse que me fez querer lê-lo. É o romance contemporâneo, que se lê extremamente bem, bastante espirituoso, como eu tanto gosto e que, de uma forma divertida, aborda temas como a amizade à distância e algo bastante em desuso, que é a troca de correspondência por carta. Acaba po Ora cá está um livro em que a capa nada remete para o conteúdo. Olhando para a mesma fica-se com a sensação que vamos ler um romance histórico. Foi a ideia que tive quando vi o livro pela primeira vez. E foi a leitura da sinopse que me fez querer lê-lo. É o romance contemporâneo, que se lê extremamente bem, bastante espirituoso, como eu tanto gosto e que, de uma forma divertida, aborda temas como a amizade à distância e algo bastante em desuso, que é a troca de correspondência por carta. Acaba por ser uma obra de gente real, com problemas reais e que vêem no anonimato uma forma de desabafar sobre aquilo que mais as tormenta. Sejam problemas actuais ou traumas passados. Por último, achei bastante curiosa a "coragem" que Jackson Cooper revela. Um Homem desabafar, com uma Mulher "estranha", problemas pessoais à conta de problemas nos seus dois casamentos e por causa da crise dos 50 é algo inaudito. O recíproco já nem tanto. A lovely book that was just so well written. The kind of prose that just flows, and you do not know why, but it's quite lovely. It's the story of Eve who has always stayed in the background. Shy, bullied by her own mother, and with a rocky relationship with her daughter. Izzy whom I first liked at the end. When it all came together, forgiveness and understanding. And it's the story of Jack, a writer struggling to write, who loves food, and who goes from woman to woman. Last it is the story of how t A lovely book that was just so well written. The kind of prose that just flows, and you do not know why, but it's quite lovely. Last it is the story of how these two strike up a friendship through letters and even though they have never met they help each other out. I picked up this book off the Barnes and Noble Bargain Books table recently wanting a quick, light read at the holidays. That was pretty much what I got. The characters were a bit annoying at times, but overall, I liked their development and how their stories came together. The best part for me of “That part was true” was that it is a fast and easy read. The significance of the title was totally lost on me. I checked during my reading but did not discover what part was true, and what part wasn’t. The characters, well-off and gentle Eve, and self-centred and handsome Jack Cooper, meet over their correspondence. Do people really spend the cost of a postcard or letter to write one sentence, which is what happened at times? At other times, there was disclosure, which fr The best part for me of “That part was true” was that it is a fast and easy read. The significance of the title was totally lost on me. I checked during my reading but did not discover what part was true, and what part wasn’t. The characters, well-off and gentle Eve, and self-centred and handsome Jack Cooper, meet over their correspondence. Do people really spend the cost of a postcard or letter to write one sentence, which is what happened at times? At other times, there was disclosure, which frankly was more interesting. The books Jack Cooper writes do not really mirror this novel at all, however the fact that he is a bestselling author is what makes him a magnet in the story. Wouldn’t we all wish to either be a millionaire author or partnered with one, the premise goes. So what makes Eve special? Her personal demons, seems the main answer. And my reading revealed that she was the very type of woman that Jack had a particular problem with. Hence, I had a problem with the story. Also the ending was to me, as slight as the rest of the story. Also the repetitive use of ‘then’ at the start of sentences stalls the writing. The long sentences that sometimes were so long-winded that they didn’t make sense, and then whole paragraphs of short sentences, which stopped the story from flowing. I’m not sure I would read the next offering by the author. A delightful delicacy of a read. Yes, perhaps a chick read in that it may appeal more to female audiences, but not necessarily, and it certainly is not a flimsy or lightweight one! The thematic messages are compelling and universal. It is not "a coming of age" novel in the traditional sense, but it definitely is so - to middle age! Therefore, I think the audience who will appreciate this lovely,lyrical prose will be readers aged over 30! The themes of friendship, love and loss, regrets, and emot A delightful delicacy of a read. Yes, perhaps a chick read in that it may appeal more to female audiences, but not necessarily, and it certainly is not a flimsy or lightweight one! The thematic messages are compelling and universal. It is not "a coming of age" novel in the traditional sense, but it definitely is so - to middle age! Therefore, I think the audience who will appreciate this lovely,lyrical prose will be readers aged over 30! The themes of friendship, love and loss, regrets, and emotional intelligence ( or lack thereof) are very thought provoking and will stay with the reader long after the last page is turned. The. characters are rich and well developed...I personally would love a sequel that would continue to explore their progress to self -actualization. Save a full day or night; I could not put the book down! Eve e Jack não se conhecem, vivendo mesmo em continentes diferentes, ela doméstica e ele um escritor. Eve após a morte da mãe, não consegue definir um rumo para a sua vida habituada a que a mão sempre a criticasse e por isso foi-se anulando como pessoa. A filha Izzy prestes a casar-se revela-se uma jovem quase parecida com a avó, mas a chegada do pai Simon e dos meios irmãos fá-la perceber, que existe família para além da avó. Jack encontra-se sem inspiração, depois de relações falhadas, encontra Eve e Jack não se conhecem, vivendo mesmo em continentes diferentes, ela doméstica e ele um escritor. Eve após a morte da mãe, não consegue definir um rumo para a sua vida habituada a que a mão sempre a criticasse e por isso foi-se anulando como pessoa. A filha Izzy prestes a casar-se revela-se uma jovem quase parecida com a avó, mas a chegada do pai Simon e dos meios irmãos fá-la perceber, que existe família para além da avó. Jack encontra-se sem inspiração, depois de relações falhadas, encontra em Eve o refúgio para desabafar e pedir conselhos e dar e receber receitas. Um romance, diferente, com um toque de culinária e uma relação de amizade á distância. Que termina num encontro esperado. This storyline and all the characters jumped right off the page at me and made me love them right from the first page. All the twists and turns made it seem like a real life story with all the bumps and curvy roads we have to take sometimes and gives a little bit of insight on how we should be embracing it. A lovely little book. An American writer and an Englishwoman correspond about food and their lives. Sections alternate between the correspondence, his life, and her life. The writing was often beautiful and the story felt true and real to me throughout. It made me think about how many other hidden gems there are out there. In the beginning, I thought Julie&Julia. It was that sort of feel as I started to read. happiness has taken some of us our full lifetime. A reader can see that here. I received an advance copy of this novel at BEA. It features an image of the Eiffel Tower on the cover with tulips in the foreground, so I thought it would make a good choice for reading on vacation or during a lazy summer day. I was also drawn to the back cover description, which involves a growing friendship between a bestselling American author, Jackson Cooper, and an Englishwoman, Eve Petworth. The story begins when Eve writes Jackson a fan letter and he replies. They discover they share a lo I received an advance copy of this novel at BEA. It features an image of the Eiffel Tower on the cover with tulips in the foreground, so I thought it would make a good choice for reading on vacation or during a lazy summer day. I was also drawn to the back cover description, which involves a growing friendship between a bestselling American author, Jackson Cooper, and an Englishwoman, Eve Petworth. The story begins when Eve writes Jackson a fan letter and he replies. They discover they share a love of food and cooking. Both are middle-aged and at a crossroads in their lives. Eve is dealing with a prickly relationship with her daughter, Izzy, who is in a frenzy over her coming wedding. Jackson is about to turn 50 and is suffering from a predictable midlife crisis and a bout of writer's block. This is a quiet novel about the joys of food, friendship and family which grew on me as I read it. I enjoyed the sensory descriptions of cooking and landscapes, the wry observations on the various characters' foibles and the letters that Eve and Jackson exchange. "Jack, removing (her) fingers by the wrist as if he were extricating a caterpillar from his salad..."
"Everything needs editing. Everything: biographies, closets, address books, friendships, fiction, life." "I think, when you're getting to your middle years, you've either got to haul yourself up, or surrender to some pretty fast sliding." The major stumbling block for me was that the characters' lives are too perfect. Both live in luxurious surroundings - Eve in a lovely home with large garden in western England, Jackson in a beach house in the Hamptons - have a housekeeper or servant, and no worries about money. It reminded me of Meryl Streep comedy, where everyone lives in gracious homes and the sun always shines. This is the first book I've read by Deborah McKinlay and it was AMAZING! It was like a present--beautiful writing and engaging characters all wrapped up with a perfect ending in just over 200 pages. This novel is about the power of words--how we use them to tell a story, to heal ourselves and those around us, even to help us find love. When 46-year-old British Eve Petworth sends a fan letter to Jackson Cooper, a slightly older successful American author, an unlikely friendship develops that chan This is the first book I've read by Deborah McKinlay and it was AMAZING! It was like a present--beautiful writing and engaging characters all wrapped up with a perfect ending in just over 200 pages. This novel is about the power of words--how we use them to tell a story, to heal ourselves and those around us, even to help us find love. When 46-year-old British Eve Petworth sends a fan letter to Jackson Cooper, a slightly older successful American author, an unlikely friendship develops that changes both of their lives in unexpected ways. I loved Eve's reserved yet eloquent voice, and the way it contrasted with Jack's brash, masculine speech. If you appreciate food, words, letters, and love, this is the book for you. That Part Was True is the best book I've read so far this year! Eve Petworth finds her 40′s to be a bit of a rocky road. Living in London on her own after a divorce, and struggling as her own adult daughter is about to be married and leaning a little too hard on Eve, Eve takes solace in books written by a popular American Novelist, Jackson Cooper. When Eve writes to Cooper informing him of her appreciation of his books and comparing one of his lines about a watery summer day to ripe fruit, Cooper to her surprise, writes back. I am not even sure if I can tell you how impressed I am with That Part Was True by Deborah McKinlay. Even now weeks after I have read the book, I glance over at it as I type with a little smile on my face. This book reminds me a little of the flow of The Guernsey Literary and Potato Peel Pie Society, but with a gentler flow to it. This one grabbed me as I enjoyed Eve and her struggles with her every day life as well as Jackson’s struggles as he continuously (sometimes hilariously) messed everything up. I almost missed this little gem because of that ho-hum, no-color cover. It looked all hearts-and-flowers, sugary romance, and, though I enjoy a good romance with complications and complex relationships, sugar-sweet is not my style. What a delightful surprise awaited me. This is a lively read, short, but it packs a lot of plot into very few pages. There is the famous guy-novel writer on the American side of the water, finishing his second marriage, exploring a new relationship, pushing fifty, and trying to finish his current novel, but entangled in regret--Jack. On the other side of the water, in England, there is quiet, demure reader Eve, finding escape in his books from the hectic life her socially adept daughter foists upon her. Eve has regrets of her own. The plot advances through separate storylines and correspondance between Eve, who writes first to tell Jack of a particular passage that moves her, and Jack, who discovers a kindred soul, lover of good food, solitary pursuits, and green growing things. As the reader, we can see that they are perfectly matched and wait for the author to bring them together. Unfortunately, there is a very good reason why Eve cannot meet Jack, and we are left at the last page reconciled to appreciating their psychological growth and pen pal friendship. Quick read, light, great characters, very realistic email/letter correspondance. What a delight to meander through this novel. An unpredictable, but simple plot, with well rounded characters and great movement and pacing through the story. I love good food, and real, handwritten letters, so this story personally appealed to me, and I especially appreciated the character building that seemed all together human and unforced. There were a few scenes where I actually completely lost my bearings. That's my only critique. One, in a restaurant, that then seemed like a living room, but then turned back into a restaurant. I read that passage a dozen times and still couldn't figure it out. There were odd things like that throughout--I think because the writer tried very hard to be spare with details, to allow the story to move sometimes with just suggestions, and the reader needed to think, and work a bit. I like that, especially since some scenes contrasted with very minute detail. An interesting writing approach. British reader Eve Petworth writes a letter to American author Jackson Cooper and thus begins the "relationship". Both have reached a stage in their lives where they must change but are not quite sure how to go down their paths. A lovely communication/friendship develops through a beautiful correspondence between the two. Eve must learn how to manage her relationship with her A-type personality daughter and manage her memoirs of her deceased mother. Jackson is at a milestone in his life and must British reader Eve Petworth writes a letter to American author Jackson Cooper and thus begins the "relationship". Both have reached a stage in their lives where they must change but are not quite sure how to go down their paths. A lovely communication/friendship develops through a beautiful correspondence between the two. Eve must learn how to manage her relationship with her A-type personality daughter and manage her memoirs of her deceased mother. Jackson is at a milestone in his life and must figure out not only what he wants/needs from life, but must work through his "writer' block" that he is currently experiencing. Although this is a fairly short book, the story flows so well and I loved reading about the slow changes in their lives. They take the common love of cooking and use it as a beautiful basis for a friendship. The plot had me second-guessing where I thought it was going, and by the end, I knew that it would be perfect. What a strange little book. Eve writes a letter to a writer, Jack. At first, the setup seems to be heading for a romantic ending for the two of them - but then I felt it lost its way. The first confusion was that they were writing real letters, not emails - and yet often, the quoted text was short, like an email. Were they writing on scraps of paper hardly worth posting, or were those just excerpts? Eventually I decided they were excerpts, and that the author must be missing out large chunks and What a strange little book. Eve writes a letter to a writer, Jack. At first, the setup seems to be heading for a romantic ending for the two of them - but then I felt it lost its way. Deborah McKinlay has published half a dozen non-fiction titles in the UK, and her books have been translated into numerous languages. Her work has appeared in British Vogue, Cosmopolitan, and Esquire. She lives in South West England. The View from Here is her first novel.